A perennial with large spikes of showy flowers that are pink to purple in color. 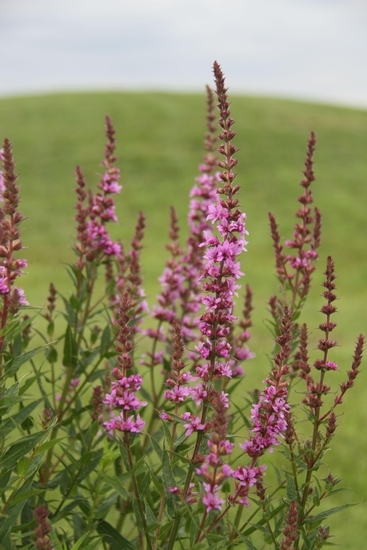 Purple loosestrife primarily grows in wet areas like roadside ditches, wetlands, marshes, and swamps. It is an invasive weed introduced from Europe that now occurs in the northern and northeastern United States as far south as Virginia. It is also sold commercially as an ornamental. Seedlings can occur but plants also arise from crowns and stem segments. Young plants that arise from crowns and stem segments closely resemble the mature plants. Seedlings have small, spatula-shaped cotyledons. The first true leaves are opposite. Leaves are arranged oppositely along the stem and lanceolate to linear in outline. Leaves do not have petioles (sessile), often have short hairs, and range from 1 1/4 to 4 inches in length. Some leaves may occur in groups of 3 but are still arranged oppositely along the stem. Square in cross-section, highly branched, erect, ranging from 3 1/2 to 6 1/2 feet in height. Stems may also have short hairs. Flowers occur in long (4 to 16 inches long) spikes at the ends of the erect stems. Many individual flowers occur on a single spike. Flowers are pink to purple in color and each have 5 to 7 petals. A capsule that is approximately 1 mm long and contains many seed. A thick crown from which new plants can arise and a fibrous root system. Stem segments that have been cut or knocked down can also root and form new plants. 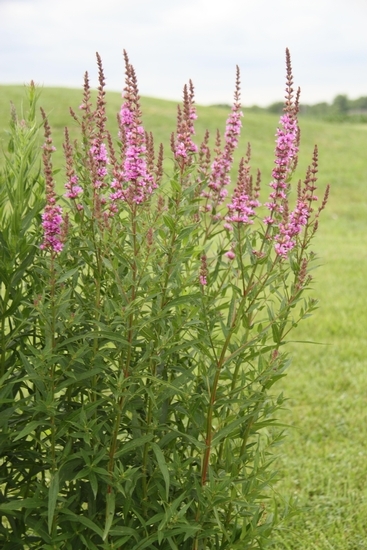 The habitat in which this plant is most commonly found, the oppositely arranged leaves, highly branched nature, and the distinctive flower stalks are all characteristics that help to distinguish purple loosestrife from most other species.